Provincial President National Conference Mr Devender Singh Rana on Sunday urged Governor Mr N. N Vohra to order a high level probe into presence of fake state subject holders settled in Jammu and Kashmir and taking effective measures in ousting them from the State. “The Jammu region in particular is grappling with serious threat to its economy and avenues of job due to presence of fake state subjects and there is crucial need of course correction on immediate basis”, Mr Rana said in a statement issued from Sher-e-Kashmir Bhavan here this afternoon. 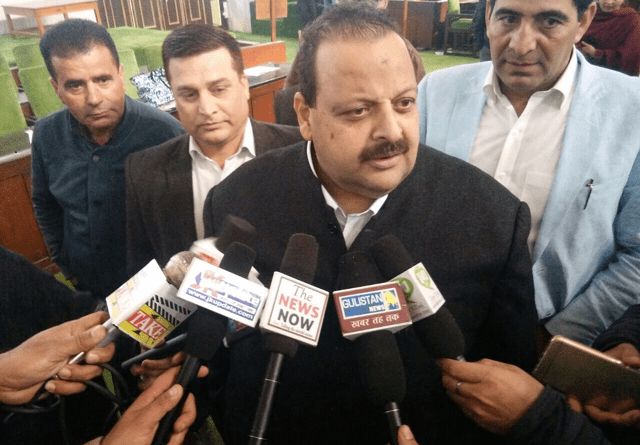 Sharing the concern of cross section of people, cutting party affiliations, who have been agitating over the challenge posed to Jammu by fake state subject holders, Mr Rana said a decisive crusade is needed to be launched to preserve culture, heritage and economy of the Duggar land. He regretted over the overt and covert attempts being made by some vested interests to negates the spirit of the State Subject laws enacted by Maharaja Hari Singh in 1927 to avert dominance of non-state subjects in the state in general and Jammu in particular. He said these forces were conveniently overlooking similar constitutional guarantees with regard to domicile in other parts of the country like Nagaland, Mizoram, Sikkim, Arunachal Pradesh, Assam, Manipur, Andhra Pradesh, Goa etc as per various sub sections (A to G) of Article 371. Mr Rana drew the attention of the Governor to the reports formulated by the State Subject Commission in 2011, 2012 and 2013 and said no forward movement has been registered in this regard so far. He reiterated that the fake state subject holderspose a grave threat to the Dogra business community and youth who are deprived of jobs in the government sector. “We appeal to the Governor’s administration to come out with a white paper on the fake state subjects and a concrete policy for dealing with erring individuals and officials, who facilitated their permanent residence certificates”, he said and sought action per law in terms of Rule 8 of JK Grant of PRC (procedure) Rules 1968 against the offenders. The Provincial President said the people of Jammu will never allow their interests to get trampled by doing away with the Permanent Resident Laws, as enacted by the visionary Maharaja, thus depriving them of opportunities in employment, business avocations and above all land holdings. “The state subject laws are a shield to the legitimate interests of the people of Jammu”, he maintained.